One Story's editor-in-chief Hannah Tinti lectures about the publishing industry and encourages workship writers to "never give up." As all good things must, the One Story Summer Writer’s Workshop came to an end this past Friday. The final day kicked off as all the others before, yet there was a tinge of nostalgia to the morning workshops as OS editors Will Allison and Marie-Helene Bertino gave their final critiques. With all the whirlwind events and information, it’s easy to leave a workshop feeling a combination of excitement and also confusion of what to do next. OS Editor in Chief Hannah Tinti stepped up to give some tips and answered students’ questions about the business side of writing for our last afternoon lecture. First, she said, always keep in mind:“It’s not publishing that makes you a writer. 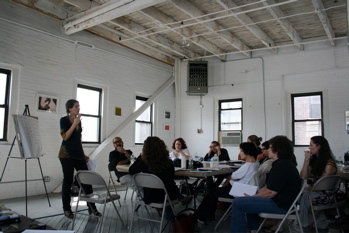 Writing makes you a writer.” But once you have a manuscript as polished as you can make it, it’s time to put on your “business hat.” Adding another perspective to the agent’s panel discussion from Monday, Hannah encouraged the workshop writers to look for agents carefully and selectively. Find the agent that’s the right fit for you. Don’t just sign up with the first agent you find or comes you way—make sure they represent similar authors and related genres. “It will save you some heartache,” she advised. If you’re working on a collection, take the same care when looking for places to submit your stories. Check out up and coming literary magazines. There are a lot of them out there. Hannah suggested looking at prize-winning anthologies such as the Pushcart Prize Anthology and Best American Short Stories. Also, subscribing to magazines like Poets & Writers and Publishers Weekly will keep you informed of what’s current. 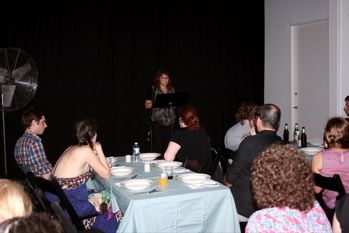 With hopes lifted and a buzz of adrenaline similar to that last-day-of-school feeling, the talented troupe of twenty gathered one last time for dinner and a student reading at Cabinet Magazine’s beautiful event space. Each writer read a few minutes of his / her own work, interrupted periodically by staff speeches and thank-yous in addition to a slideshow of pictures from the week matched to Lenny Kravitz’s “It Ain’t Over till It’s Over” (selection courtesy of workshop-coordinator Michael J. Pollock). Perhaps the most wonderful part of the evening (besides the opportunity to hear everyone’s work) was the continuous and gracious thanking. Marie-Helene gave a wonderfully sweet speech thanking the One Story staff for all of our dedicated work (in which she matched each staff member to various parts of the body) as well as genuine gratitude from workshop students and staff. A nostalgic mood pervaded the night, despite the fact that the workshop was only for one week. However, I spoke to one of the workshop participants about the comraderie present and she pointed out how amazing it was that everyone could open up and share a part of themselves in so little time to a group of perfect strangers. A writer’s workshop is a vulnerable experience indeed and it is perhaps this sharing of words that make workshops both intense and unique. And to continue with Marie’s metaphor for the One Story body, if I may, the writers from this summer’s workshop are like the lungs: bringing in fresh air, and pushing out again, to someplace new. This entry was posted in Events, From the Trenches by Rose Heithoff. Bookmark the permalink.